Before and during the 300-mile ride, they raised more than $3,600 for Hope House, which provides a home for children coming from especially difficult circumstances. BOISE, Idaho — Idaho has experienced wild weather across the state, including wind, rain, hail, mountain snow, and flooding. 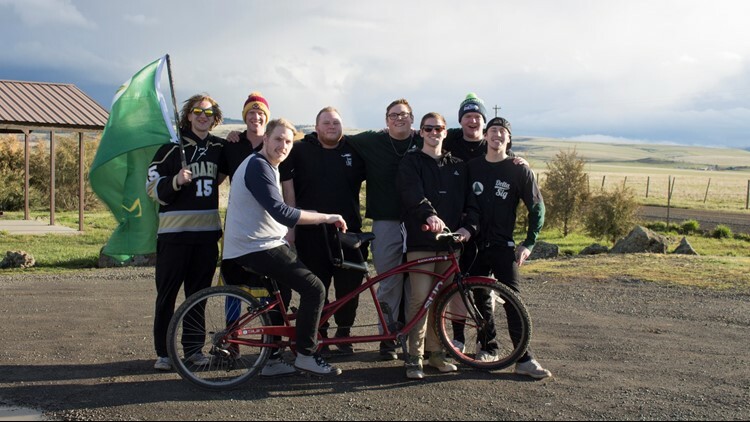 Members of the University of Idaho's Delta Sigma Phi Chapter experienced a lot of it first-hand during their annual 300-mile "Bike to Boise" ride. On Thursday morning, the fraternity members took turns riding a tandem bike from Moscow through Lewiston, down White Bird Hill, into New Meadows, where they camped overnight. They then rode to McCall, Cascade, Horseshoe Bend, and other places in between their way to the Idaho State Capitol in Boise. Delta Sigma members and children and staff from Hope House met outside the Statehouse on Saturday to get to know each other a little bit and share some doughnuts.